Volunteers are a core part of what makes your organization successful. Make sure they have the best experience possible, while also being productive, by using a system that manages your volunteers throughout the process. Volgistics' volunteer management software makes it easy to manage your volunteers from online application forms to awards calculations. Our user-friendly, online interface is loaded with features your organization can customize to fit your culture and goals. Even better, our volunteer management system is entirely web-based, so you can access your volunteer information from any computer with an internet connection right through your web browser. With no software to install or maintain, you don't need dedicated hardware or any IT support! Volgistics serves as a comprehensive volunteer management application, with features designed to manage and communicate with your organization's volunteers from day one. 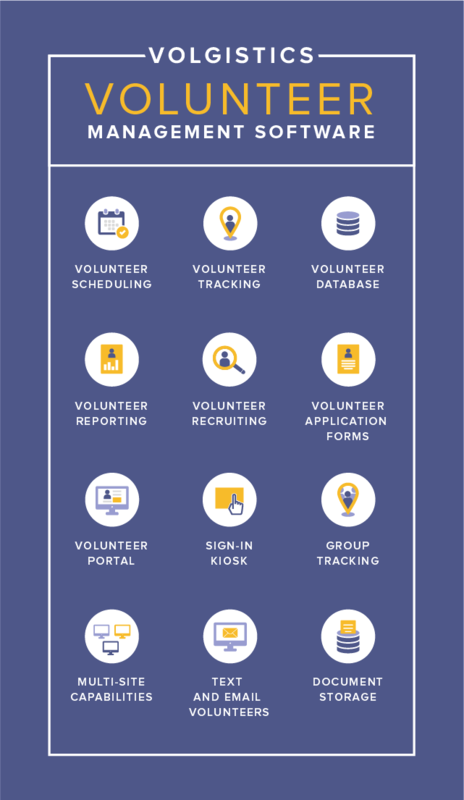 Volgistics provides many features to help volunteer leaders stay organized and help your organization schedule your volunteers, with flexible scheduling options and both automated and manual volunteer reminders. Our easy-to-use system helps you track detailed volunteer information, such as name, contact information, etc. You can also track volunteer hours both in total and by assignment, or keep track of other service measures like mileage or number of tours. Volgistics uses a sophisticated relational database to store your volunteer information. There is no software to install, no updates to worry about, and you can access your account from anywhere with no IT support required! With Volgistics, you can quickly and easily generate the reports you need in PDF or Excel format. Use one of the built-in stock reports, or create a custom report through our easy-to-use interface. If you need help, our support team can guide you through the process. Volgistics includes features to help you advertise your volunteer opportunities, provide application forms, and easily add applicants to your database, all from your organization's existing website! With Volgistics, you can collect information from prospective volunteers using online volunteer application forms embedded into your website. Volgistics can then automatically add that information to your database without requiring manual entry, saving your organization time and resources. With the optional VicNet module, volunteers can check their schedules, sign-up for schedule openings, update their personal information, post their service, and receive messages from you; all from any internet-connected computer. VicTouch is an optional software module you can use with Volgistics to provide on-site touch screen workstations or kiosks for volunteers to sign in and out and view basic information. Volgistics allows you to use group volunteer records to track groups of people who serve collectively as part of a business, service, social club, fraternal organization, or similar group. In some organizations, it is useful to have a single volunteer database in which different users have access to only some of the volunteer records. Volgistics makes this possible through a feature called Site Level Access. Communicate and engage with your volunteers using the channel they prefer to make sure they receive and read your messages and reminders. Text messaging is completely free but requires access to the volunteer portal. volunteer portal. Store documents and other files electronically with each volunteer record, including driver's licenses, contact information, applications, waivers, and other information. You can also scan existing paper files and save them in Volgistics to clear out your filing cabinet. On top of it all, Volgistics provides extensive support for our customers through our broad library of video tutorials and a dedicated support team with a quick response time. Are you interested in learning more about Volgistics software for managing volunteers and what it can do for your organization? Contact our support team or sign up for a free trial today! If you are interested in how our Volgistics software works, register for a live demonstration! Try it for 30 days or create a FULL account today! All Content © Volgistics, Inc.